Wooster City Hall is located at 538 New Market Street, Wooster, OH 44691; phone: 330-263-5200. Photo: Liggett-Freedlander House, ca. 1861, 408 North Beaver Street, Wooster, OH. Listed on the National Register of Historic Places in 1994. Photographed by User:Nyttend (own work), 2012, [cc0-by-1.0 (creativecommons.org/publicdomain/zero/1.0/deed.en], via Wikimedia Commons, accessed September, 2014. The origin of Wooster can be traced back to three notable men who surveyed the area in 1808—Joseph Larwill, William Henry and John Bever. Working for the US Government, these men platted the village of Wooster which was named after the famous Revolutionary War hero General David Wooster. In May of 1811, Wooster was designated the county seat and was incorporated as a town in October of 1817. Wooster was situated near the convergence of three important Indian trails, which later became the first roads for the white settlers. Soon Wooster became a major stop on the trail from Cleveland to Columbus. Most of the historic buildings standing today in Wooster date back to the last quarter of the 19th century through the first quarter of the 20th century. Wooster follows a typical town plan with main streets intersecting at the town square and with downtown building facades rising directly from the sidewalks edge without front yards or setbacks. Wooster functions as the industrial, educational and commercial center for the surrounding area. The consumer is offered a variety of small, privately owned enterprises, major department stores, financial institutions, professional and governmental offices. Wooster's image is characterized by tree-lined streets with well-maintained buildings and homes and by a vital and compact central business district. Residents are provided with a wide variety of housing choices and locations. 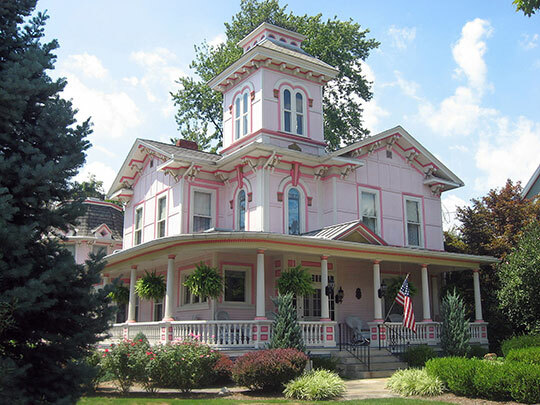 Various 18th and 19th century styles, chiefly Victorian, Italianate, Renaissance and Greek Revival are found in Wooster. There are also some examples of Federal, Art Deco and Second Empire architecture dating from the late 19th to early 20th century. The importance of the variety of architecture in Wooster, such as contained in the Public Square Historic District and the College of Wooster Historic District, has been nationally recognized with their listing on the National Register of Historic Places. City of Wooster, Design and Review Board, Wooster's Historic Properties and Districts, Design Guidelines, 1999, www.woosteroh.com, accessed September, 2014.